The black color of this sphalerite sample indicates a high iron content. Sphalerite is a mineral that consists largely of zinc sulfide in crystalline form, but it almost always contains variable amounts of iron. Its chemical formula may therefore be written as (Zn,Fe)S. Its color is usually yellow, brown, or gray to gray-black, and it may be shiny or dull. This mineral is the chief ore of zinc, the fourth most common metal in use. In addition, appropriate crystals of sphalerite have been fashioned into gemstones. The various colors of this sphalerite sample indicate the presence of various impurities. The unit cell in a crystal of sphalerite. Sphalerite is usually found in association with other minerals, particularly galena, pyrite, and other sulfides, along with calcite, dolomite, and fluorite. Miners have referred to sphalerite as zinc blende, mock lead, false galena, and black-jack. Significant quantities of this mineral have been found in many parts of the world, including Australia, Burma, Germany, England, Italy, Spain, and Peru. In the United States, it is found in Elmwood, Tennessee; Joplin, Missouri; and Rosiclare, Illinois. As noted above, sphalerite can be found in various colors, particularly yellow, brown, and gray to gray-black. It has a yellow or light brown streak. Its hardness rating is 3.5-4 on the Mohs scale, its specific gravity is 3.9-4.1, and its refractive index is 2.37 (when measured using sodium light at 589.3 nanometers). Its dispersion of light is more than three times that of diamond. Some specimens, called "ruby sphalerite," have a red iridescence within the gray-black crystals. The pale yellow and red varieties have very little iron and are translucent. The darker, more opaque varieties contain more iron. 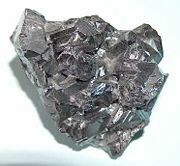 An opaque, black variety with a high iron content is known as marmatite. Gemmy, pale specimens (such as from Franklin, New Jersey) are highly fluorescent orange or blue under longwave ultraviolet light and are known as cleiophane, an almost pure variety of zinc sulfide. Sphalerite crystallizes in the isometric crystal system and possesses perfect dodecahedral cleavage. 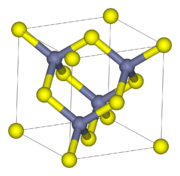 In the crystal structure, zinc and sulfur atoms are tetrahedrally coordinated. This structure is closely related to that of diamond. Two other minerals, wurtzite and matraite, are polymorphs of sphalerite. They share the same chemistry (zinc iron sulfide) but have different crystalline structures. Sphalerite is mainly used for the extraction of zinc, the fourth most common metal in use, trailing only iron, aluminum, and copper in annual production. In addition, crystals of suitable size and transparency have been fashioned into gemstones, usually featuring the brilliant cut to best display the stone's high optical dispersion. Freshly cut gems have a lively, adamantine luster and could be mistaken for fancy-colored diamonds, but given sphalerite's softness and fragility, the gems are best left unset as collector's items or museum pieces. Some specimens, however, have been set into pendants. Gem-quality material is usually a yellowish to honey brown, red to orange, or green; the two most important sources are the Chivera mine, Cananea, Sonora, Mexico; and the Picos de Europa, Cordillera Cantabrica, near Santander on Spain's northern coast. Mindat.org. 2007. Sphalerite Mindat.org. Retrieved November 7, 2007. Mineral Gallery. 2006. The Mineral Sphalerite Amethyst Galleries. Retrieved November 7, 2007. This page was last modified on 16 October 2015, at 15:57.